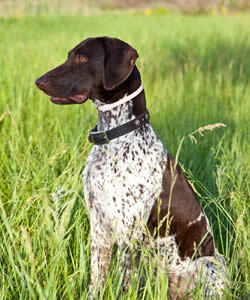 The hunting dog names list includes some of my favorite names for your gun dog, pointer, flusher, retriever and more. The list also includes many of my favorite one syllable dog names. Some of the names are tied to gun manufacturers, old movie actors or hunting commands. Some are here just because I like how they sound. I’m sorry, but names like Fifi or Fido just don’t get it for me. When I added every name to the list, I envisioned myself calling a hunting dog by that name. If the name didn’t sound right to me, it didn’t make the list. Nothing personal to those of you hunting with Fluffy, Powder Puff or Precious (sorry, Lord of the Rings fans!). Three of my favorite names are Dutch, Kody and Scout. In my case, Kody actually stands for Kodiak, which was the name of my second German Shepherd (the first Shepherd was named Baron). This advice is warranted, but should not rule out one syllable hunting dog names. One of the best hunters I know uses one syllable names exclusively. Two of my favorites were Ratt and Tuff. Below is a list of more than 70 of my favorite hunting dog names, many with explanations of why I chose them. Browse or study the list and have fun. Apollo If you need two dog names, you could name them Apollo and Zeus. Artemis Goddess of the wilderness. Bailey This is my chocolate Labrador Retriever’s name. Visit our Labrador dog names list if you have a Lab of your own. Buck My sister’s Black Labrador Retriever is named Buck. This is also a favorite among one syllable dog names. Buffy As in, Buffy the vampire slayer. Conan For Arnold Schwarzenegger fans, as in Conan the Barbarian. Cujo Remember the Stephen King movie? Duke My favorite cowboy – John Wayne. Dutch I like the sound of this name. Reminds me of an old wrestler named Dutch Savage. General The commander of the army, pack leader, leader of the band, etc. Hunter Maybe the reason for this name is a little too obvious? Jag A good choice among one syllable dog names. Kody This was the name of our second German Shepherd. Actually, it was Kodiak. Visit our German Shepherd dog names list for more suggestions. Kona If you love Hawaii or coffee, this is a great name. But it’s also very popular among hunting dog names. Predator An appropriate name as a hunter, but three syllables may be to many for some tastes. Ratt Name of my friend’s Black Lab hunting dog. Also see Tuff. Rip No special meaning behind this one. I just like the sound of it and I like one syllable dog names. Scout One of my favorite hunting dog names. Also good for those who like one syllable dog names. Todd Remember the movie, Fox and the Hound? This is a great hunting dog name. Trigger Name of Roy Rogers’s horse. Also part of a gun (yes, you already knew that). Tuff Name of my friend’s Black Lab hunting dog. Also see Ratt. Winchester One of the most famous gun manufacturers. Can’t find the name you like on the Hunting Dog names list? Don’t give up. Visit our Dog Names by Breed list or one syllable dog names list to do some more hunting (pun intended). If you have a great name, tell us about it!